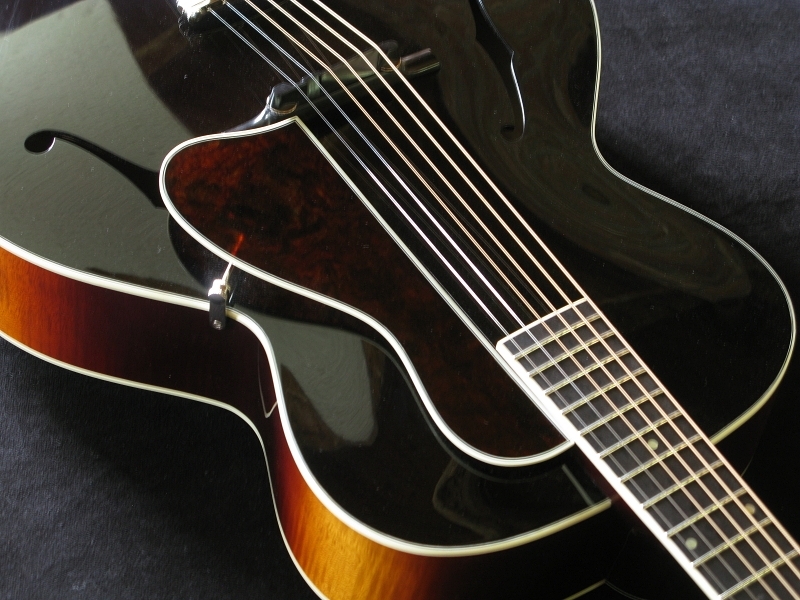 When the Gibson L-5 16" archtop guitar was first offered in 1922, it set the bar for all archtop makers. In it's day it was influential and widely copied. The "Carmen elle" or "Elle-5" is my version of that iconic guitar. I've kept the same beautiful size and shape of the original, and added a few of my own details, most notably, an X-braced top and solid foot bridge. 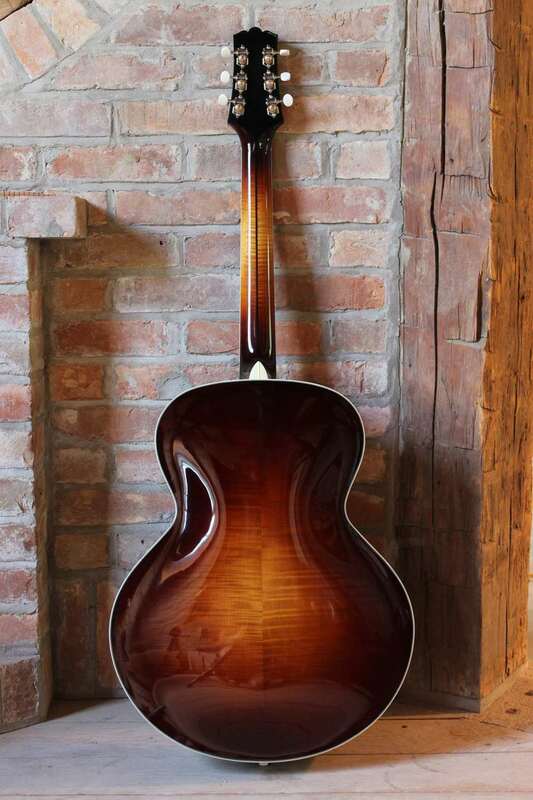 The back and sides are curly maple, with a premium X-braced sitka spruce top. Both the top and back plates are finely hand graduated. The curly maple neck is a three piece lamination with an ebony center line, and a two-way truss rod. The fingerboard and headstock front/back faces are black ebony. I hand make the trapeze tailpiece and pickguard bracket from brass, finished in nickel plating. The pickguard is made from tortoiseshell celluloid and bound in Ivoroid, black ivoroid. The body as well is triple bound, as is the headstock. 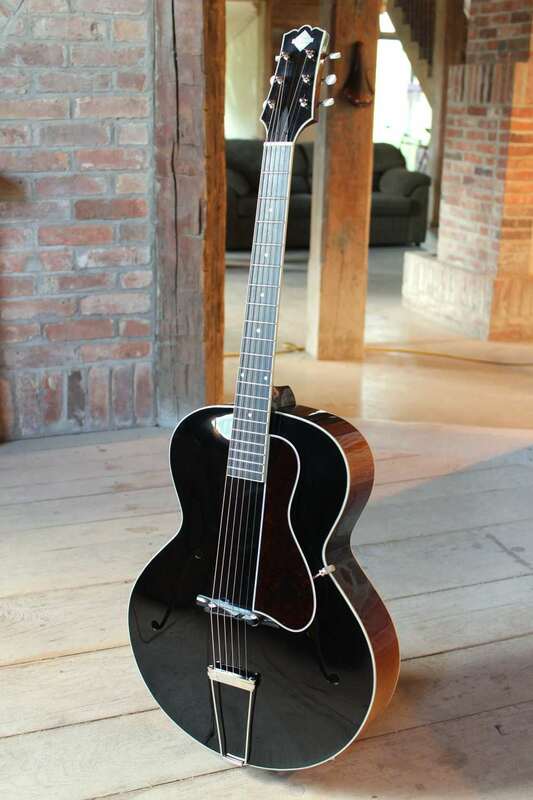 The bridge is handmade from African blackwood and has thumbwheel height adjustment. I offer three finishes on this model, 1) blond 2) black face, with cremona sunburst, back, sides and neck 3) an all over cremona sunburst. All versions hand polished to a high gloss. An optional Lollar "Johnny Smith" pickup can be fitted to the pickguard. This guitar comes with an Ameritage/Yanuziello hardshell plush-lined case.